I’m going back to the oldest question in the pile and talking about some higher player count hidden gem boardgames. I also thought this question fit well for a follow up to the last Ask the Bellhop where we talked about food at game night. Thanks for the question Emmett. My Monday night game group is usually in this player count range so hopefully I can suggest some games that weren’t on your radar. I’m going to take “after dinner” to mean medium length games. Games that are going to take some time and give you something to fill that time between dinner and bed. So no all night event style games like Twilight Imperium or Mega Civilization . I’m going to cheat a bit here for my short answer and give you my personal top recommendations for that time slot and that player count. The thing is, that neither of these games can really be called underrated or lesser known. For those you are going to have to check out the long answer. Terraforming Mars is my number one choice for 4 or 5 players. Unfortunately it doesn’t play 6. With 4 players you are looking at 1.5 to 2.5 hours and with 5 add another half hour to that. If you use the drafting variant expect it to go even longer, maybe hitting the 4 hour mark at max player count. I talk about this game all the time so I don’t think I need to share more. It is one of the best games in my collection. My second recommendation, for when you get that 6th player, is another one of my long time favourite games, Power Grid . As I mentioned when I did my re-review of Power Grid, it’s been in my top game list for 12 years in a row now. Now a days I recommend picking up the newer Deluxe Edition, if you don’t own it yet. This is an extremely solid route building and auction game that I never get tired of. Yes there’s some math but it’s all just basic addition and subtraction. Yes, I know I cheated in the short answer. The thing is I couldn’t really think of a quick way to list off a bunch of 4-6 player games that I think are hidden gems. I couldn’t just pick one that stands out as the be all end all of after dinner games. As it is, I think I’m going to have to break this list up. There are a lot of games that play 4-5 players and are amazing. 4-5 seems to be a sweet spot for publishers. It’s when we get to 6 players things get a little harder. I decided to actually stick with games that will play a full 6 player count, just to limit my options. As for these games being hidden gems. That part is tough. I spend a lot of time consuming board game media, so I hear about all kinds of games. Sure everyone knows about Catan (with the 5-6 player expansion ), but what about Wallenstein ? Is that lesser known? Note: Wallenstien would be on this list but only plays 5. It is amazing though, so if you only have 4-5 players, check it out. As I have done for most of these game recommendation lists, I’m going to try to break things up so that it’s easier to find a category you are interested in and focus on that so you don’t have to worry about the full list. Once you get up to 6 players, you hit that sweet spot where party games actually work. Now I’m not a huge fan of most party games but there are a few I really dig. Concept – This is my go to party game. It’s a clue guessing game where one player gets the clue word/phrase and has to use tokens and a board filled with a ton of icons to try to get people to guess the clue. What I love about this game is it doesn’t require anything like skill at drawing, wordsmithing, enunciation or spelling accuracy to give clues. Can be played in teams, if you want. Just toss out the scoring system from the rules and play as an activity. 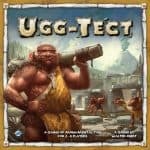 Ugg-Tect – This is one of the oddest games in my collection. It’s a team based game where you are playing cave man engineers. One player per team is the Ugg-Tect and has to try to get the other players to build a specific structure. Both teams are in a race to build the same thing. The trick is that you can’t use English when giving directions. You have to use set caveman words and body motions to direct your team. The game also includes blow up clubs that you use to bop your teammates. One bop means good job, two bops means they did something wrong. La Boca – Another dexterity game but with a much less silly theme. In La Boca you pair up with another player and attempt to build a pattern out of wooden blocks. The thing is you sit opposite each other and each player only sees their side of the pattern. They work together to finish the build as quick as possible getting points for how fast the build is completed. Both players get the same points, then next round a different pair of players plays. By the end of the game you will have played with each other player twice. Teamwork is key here. These are lighter games that are good for non-gamers or when you really want to socialize while playing something. Bohnanza – Back when I got into Eurogames everyone knew Bohnanza but now a days I can’t remember the last time I heard anyone talk about “That bean game.” Bohnanza is a set collection based card game with a ton of player interaction through trading. The unique thing in this game is that once you get your hand of cards you can’t change the order of them and you need to play the first card in your hand every round. So if you don’t want it you better do a good job trying to trade it away to the other players. I have played a ton of Bohnanza over the years and still love it. Rise of Augustus – We affectionately call this game Roman Bingo. It’s a set collection and tableau building game where you are trying to collect sets of resources in order to play various senators to your tableau. The thing is that the resources are collected by drawing tokens out of a bag in a very Bingo like style. It seems simple at first but is actually quite engaging to play. There’s way more game here than you would think. San Francisco Cable Car – This train game is a next step above Tsuro . Players play tiles on the board trying to build the longest rail lines as possible. Unlike Tsuro, you can play your tiles everywhere and there are multiple trains in your colour you need to worry about, it’s not just one pawn you are trying to protect. There is significantly more player interaction in Cable Car. Once everyone understands the game, add the stock market variant where no one player owns any particular colour and you buy stocks in each colour throughout the game. The player with the most valuable portfolio wins. Euphoria – Everyone knows about Scythe from Stonemaier games, but what about Euphoria? This is a medium weight dice based worker placement (and displacement) game where you are trying to build a better dystopia. Dice are your workers and the number on the die represents their knowledge. High worker knowledge means bonuses and more production but if the workers get too smart they may desert you. Multiple paths to victory and a cool theme keep getting this one back to my table. Mutant Meeples – This is an update to the classic game Ricochet Robots which is a board game version of the classic sliding object puzzle, where you are trying to get an object to a spot and objects move in straight lines until they hit a wall. In this case the objects are super heroes represented by meeple. A target is put out on the board and everyone determines how many moves it will take for them to get to the target. The player who is able to do it in the least moves scores. To make things interesting each type of meeple has a super power that breaks the rules. maybe they can go diagonally, or jump over the first wall they hit. If you have a puzzle lover in your group they may dig this one. Shadows Over Camelot – Another one I re-reviewed recently. Shadows Over Camelot was one of the first board games to include cooperative gameplay. It was also one of the first to add in a hidden traitor element and I still think it’s one of the best examples of the genre. While I’m not a fan of social deduction in games I really love Shadows Over Camelot. The theme here is fantastic and I love that the game has some RPG elements. Thunder Alley – This is a fantastic NASCAR based racing game from GMT. Note I am not at all, in the least, a NASCAR fan. I’m not even a race fan. This is the best racing game I own, beating out even the classic Formula D (also good at 6 players). Thunder Ally is a card driven race game where players play not just one car but an entire team of cars. It’s your overall score that matters here and it’s on what position every one of your cards finishes at. A unique movement system takes into account stock car style racing with packs of cars moving, drafting, etc. I was shocked by just how good this game was the first time I played it. Scoville – A game about growing and selling the spiciest peppers you can. Besides a unique theme, Scoville mixes set collection with a really unique pepper breading system. No only are you trying to get the right peppers to fulfill market orders you are also trying to complete chili recipes for big time bonus points. While I do think the board gets a bit crowded at 6 players, making crossbreeding difficult, this is an excellent game at all player counts. If you served chili for dinner, this is the perfect follow up game. Struggle of Empires – This is a classic Martin Wallace civilization building game set in the Age of Renaissance. Build armies and fleets, make alliances, establish colonies, improve your economy and try to take over the world. Avoids the potential bad feelings of Diplomacy by making all alliances binding. This is a heavy, meaty, older, Martin Wallace game that is one of his best. Second only to Brass in my opinion. A classic you just never hear about. There you have twelve games that play 6 players that I would consider hidden gems. Games you don’t hear every week on your favourite podcast (though you will hear about them on ours). What are some of your favourite 4-6 player games, great for getting out after dinner? Let us know in the comments.